Where is Sudan located on the world map? 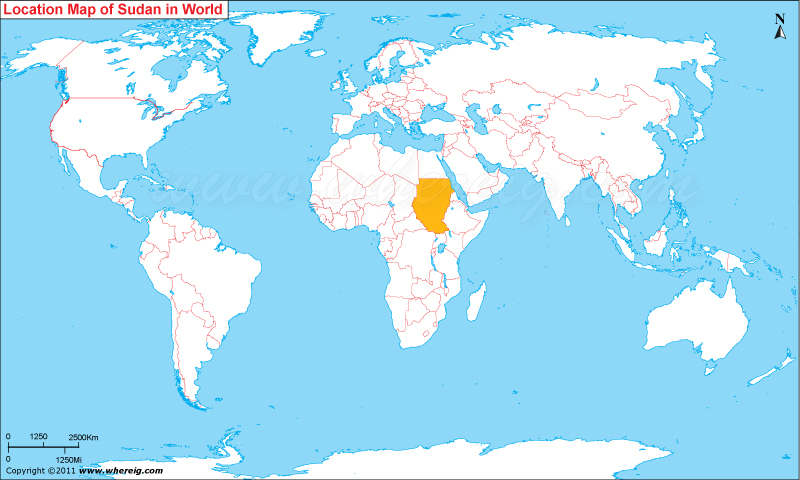 The given Sudan location map shows that Sudan is located in the north-east part of Africa continent. Sudan map also illustrates that it shares its international boundaries with Egypt in the north, Libya in the north-west, Chad in the west, Central African Republic and Democratic Republic of Congo in the south-west, Uganda in the south, Ethiopia in the east, and Eritrea in the north-east. Besides, Red also lies in the north-east of Sudan. Above all, the world�s longest river Nile divides Sudan into east and west part. Khartoum is the capital city and it serves as the political, cultural and commercial centre of the nation. However, the largest city is Omdurman. The government type of Sudan is a federal presidential representative democratic republic featured with multi-party system. Under this system, the President of Sudan is head of state, head of government and commander-in-chief of the Sudan People's Armed Forces. However, the legislative power is vested in both the government and the bicameral parliament. And, the judiciary is independent that is obtained by the Constitutional Court. Sudan is a member of the United Nations along with member status with the African Union, the Arab League, the Organization of the Islamic Conference and the Non-Aligned Movement. The country was suffering from civil war since long time, resultantly; in the year 2011, the civil war ended with the signing of a Comprehensive Peace Agreement. In fact, this peace agreement facilitated autonomy to the southern region of the country. Moreover, the economy of the country is largely depends upon the agriculture. However, the country is full of natural resources including petroleum, natural gas, gold, silver, manganese, gypsum, mica, chromite, uranium, copper, asbestos, zinc, iron, lead, kaolin, cobalt, granite, nickel, aluminum, and tin.